It’s the world’s largest treehouse, and it is made of nothing but reclaimed, recycled, and reused materials. 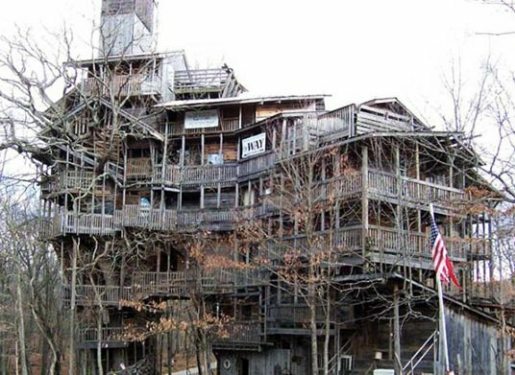 God told Horace Burgess, of Crossville, Tennessee, to build a treehouse and promised that he’d never run out of materials. Ten stories, 100 feet of height, and $12,500 in nails later, he still hasn’t ended up short of material. The treehouse, known as the Minister’s Treehouse, is simply a gigantic, beautiful home. Just how special is this home? Well, for starters, the foundation of the building is an 80-foot-tall white oak tree. There are 10 floors, each 9-11 feet tall. There’s a belfry (built for the couple’s eleventh wedding anniversary), a basketball court, a choir loft, spiral staircases, balconies, skylights, and a sanctuary! And when I say it was built with recycled materials, that’s no joke. Every scrap of wood, window, and everything but the nails is recycled from old sheds, barns, and what-have-you. As for the nails, there are 258,000 of them.